Family car contenders | What Car? The Skoda Superb is such an enormous chunk of car that you could be forgiven for thinking youve turned to the luxury car section by mistake. As well as being big, the Superb is also clever, with a boot lid that can be opened like a saloons or as a hatch. Either way, the 565-litre load capacity is immense. The Skoda is also a cut above most of its opposition if you judge it by the quality of the cabins dense, soft-touch plastics, classy chrome highlights and slick-operating switchgear. One aspect of our favourite Superb that isnt super-sized is its diminutive 1.4-litre petrol engine, although the efficient turbocharger helps it to pump out a healthy 123bhp and 148lb ft of torque. This means it has more than enough get up and go. The 1.4 TSI also does an average of 41.5mpg and pumps out just 157g/km of CO2, so it wont tax your coffers too much. Bear in mind its list price is just 16,670 and youll see that all this luxury comes at a cost thats far from luxury-car money. It's a real tragedy that the Ford badge on the front of the Mondeo prevents some people from considering it we think its brilliant. Its truly great to drive, thanks to a silky ride and superb refinement, and its great value now that Ford has cut the cars prices. 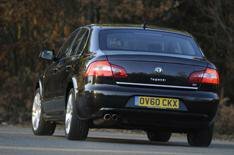 The Mondeo was face-lifted in 2010 with subtle exterior tweaks and a smarter, more robust interior. Along with the cosmetic spruce-up came a range of fuel-efficient petrol engines and a choice of six-speed manual or Powershift twin-clutch gearboxes, but wed stick with the 138bhp 2.0-litre diesel engine, which is smooth, punchy and economical. Our chosen Zetec trim includes dual-zone climate control, Bluetooth and alloy wheels. High-tech options include blind-spot monitoring, automatic high-beam adjustment and rear-view parking camera. The Mondeo is head and shoulders above rivals such as the Citron C5, Toyota Avensis and Vauxhall Insignia, and we have no doubt that its more than capable of ruffling the feathers of many high-profile German saloons. Despite the fact that every panel is new, its obvious that the folk in Volkswagens styling department havent exactly overworked themselves with the Mk7 Passat. Even so, the new car is a significant improvement over its predecessor. Thicker glass and more sound-proofing material makes it quieter; youll notice only the mildest clatter from the 2.0-litre diesel engine in town, and that disappears on the motorway. Our chosen Passat has fuel-saving Bluemotion technology and a six-speed gearbox as standard, which means the 2.0-litre turbodiesel is capable of 61.4mpg on the combined cycle and has low CO2 emissions. Inside, things are exceedingly spacious, and although the style of the cabin is very similar to that of the old car, the higher-grade materials, smart metallic trim and centrally mounted clock give it a lift. The Passat remains one of the best family cars to drive. Consider the improved refinement and efficiency, and it makes a more compelling proposition than ever. Many users of these cars will be fleet drivers, but Id urge families to look at them. Take your family on the road and the laws of physics go out of the window: the smaller the child, the more space you need. A baby means finding room for a car seat and then space for nappies, prams, more nappies, a change of clothes, and some nappies. Meanwhile, a nine-year-old may be happy with a PSP and somewhere to put her Sunny D.
My second daughter has just arrived so I know that looking into the vast boot of a family car is enough to give you a warm glow of satisfaction yes, it will all fit! Its easy to be seduced by MPVs and crossovers that promise to be the ultimate family-carriers, but Id urge you to take a close look at the very best family cars we have here.